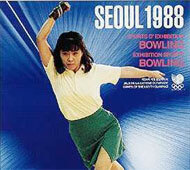 Seoul, Korea, 1988: Asian bowlers reaped the rewards of bowling's first official appearance in Olympic Games, with Kwon Jung-Yul netting a rare gold for the host country, and an even rarer gold for Arianne Cerdena of the Philippines, whose athletes had never before won the top award in any Olympic competition. Kwon Jong-Yul kept the gold in South Korea when he captured the men's division in an exciting finale that had the crowd urging him on. Meanwhile Arianne Cerdena became the first Filipino ever to capture an Olympic gold when she won the women's division. Kwon finished second, behind Singapore's Jack Wong Loke Chin in the 11-game preliminaries. Then, after a modest 177-164 victory over Finland's Tapani Peltola in the first stepladder match, Kwon went on a strike binge. He stung top seed Wong, 236-194, to force a rematch under the double elimination format. With everything on the line, Kwon clouted eight of 12 strikes to win the final match against the Singaporean, 254-223. The partisan Korean crowd greeted Kwon's victory with undisguised glee, which included some obviously nationalistic flag-waving and a chorus of cheers rarely heard in the midst of usually antiseptic TV finale aired by NBC Sports. Meanwhile, the women's finals featured a dramatic turn of events when Filipino Arianne Cerdena became the first Philippine athlete to capture a gold in the Olympics. Cerdena started out on the top rung of the stepladder after taking first place in the women's round robin, followed by Finland's Annikki Maattola and Japan's Atsuko Asai. After disposing of Maattola, 209-187, in the first match, Asai went on to defeat Cerdena, 197-180, to force Cerdena into a rematch. The Filipino took charge in the last game, outpinning her opponent, 249-211. Cerdena credited her victory to her coach, Ernesto Lopa, who insisted she tryied an outside line in the last game after nothing else worked for her in the first match. The victory may mean a huge monetary reward for Cerdena. Asia Breweries, makers of Kasrlsberg Beer, recently offered one million pesos (about U.S.$50,000) and a new home to any Filipino who could bring home the gold in the Seoul Olympics. True, bowling was only an exhibition sport, but a gold was still a gold. "We're sure she'll get something," said coach Lopa. "But we won't know for sure until we get home." In all, a total of 20 nations competed in bowling's first exhibition, which was held at Seoul's Royal Bowling Center. Team USA bowlers, who usually fare well in international events, failed to make the grade in Seoul. Mark Lewis took the last spot in the top half of the men's 12-bowler round robin, while Debbie McMullen finished one spot below, in seventh place of 12 spot's in the women's division. Amid rumors of riots, all was peaceful in the Land of Morning Calm, but if you listened closely, you could hear the sound of tenpins falling. It was an historic moment for the bowling world. It is hoped that there are more such chapters to come. After witnessing the excitement and the special ceremonies attached to bowling's first Olympic appearance, the bowling family has seemingly pulled closer than ever in making sure that there will be a next time. However, as we all know, the sport has not made a return to the Games since.